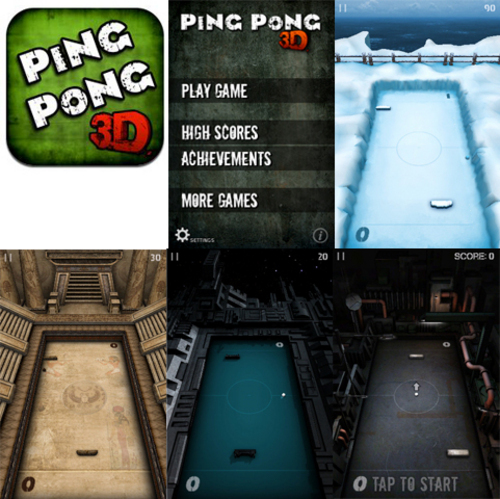 Ping Pong 3D 1.0.0 iPhone and iPod Touch. Play the ultimate classic game in amazing 3d graphics. Play through 4 unique levels with 3 difficulty settings. Use your finger or accelerometer to control your bat and defeat the opponent. 4 unique levels including Arctic, Space, Machine, Egyptian and a Bonus level. After every game you will get some Coins, use the coins to unlock new levels. Publish Score to Facebook & Twitter. iPhone, iPod touch and iPad compatible. Requires iOS 3.0 or later.